I'm a grad student with a procrastination problem, join me as I try to check things off my To-Do list. Use the first shortcut to log your favourite podcast episodes from Overcast to an Airtable database, and then, when you're not sure what to listen to next, use the second shortcut to retrieve a random episode and open it in Overcast. Overcast is my podcast player of choice but this shortcut could likely be used with many other podcast apps with little to no modification, if there's another podcast player that you prefer, let me know in the comments if you need help getting the shortcut to work! I've included the technical details on how the shortcuts are built at the end of the post if that's your cup of tea. Prepare your Airtable base where you will log your podcasts. In order for the shortcut to work without any modification on your part, your new Airtable base must contain the same fields as mine, titled identically (including capitalization). There are four fields that you need to make: A single line text field titled "Episode Title," a single line text field titled "Podcast," a URL field titled "Link," and a long text field titled "Notes." Get the API key and link for your new Airtable base. 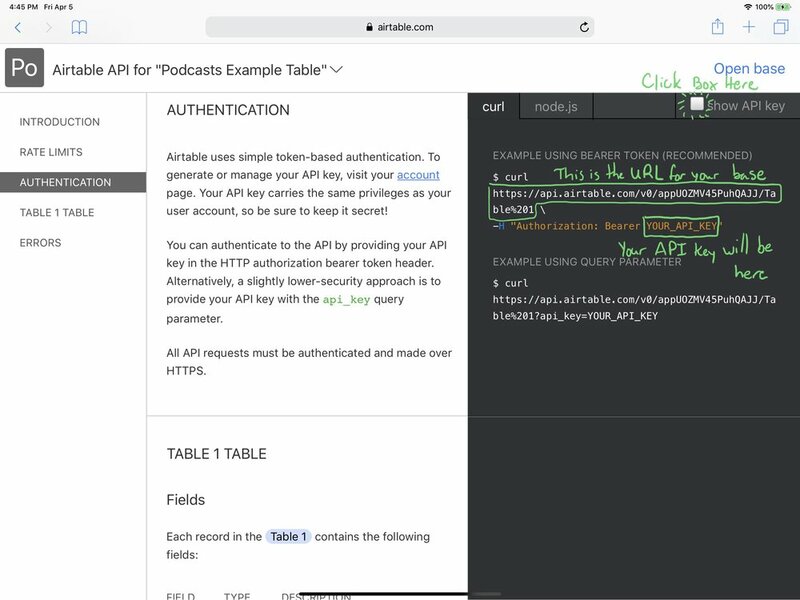 Once you have your database created, there are two key pieces of information that you need to grab from the Airtable API in order for the shortcut to add new entries to your database. Log in to the API and select the base you just created. Don't worry if APIs are not your thing and it looks confusing, we just need to copy and paste two pieces of information and then we can get out of here. Click on the Authentication tab for your database. First, you need your API key, this is how Airtable gives you access to make changes. To get this, check the box that says "show API key" and then your key will appear where it says YOUR _API_KEY. Make a note of it somewhere for later. Then also make a note of the URL for the table where the new entry will be made. That's it, API section over, the shortcut will take it from here! Download and set up the shortcut. Use this iCloud link to download the shortcut into the Shortcuts app. Once you import the shortcut, you will be asked for your API key and the URL for your Airtable base. Congratulations! This shortcut is now ready to go! Open the information tab in Overcast of a podcast you wish to log to Airtable. 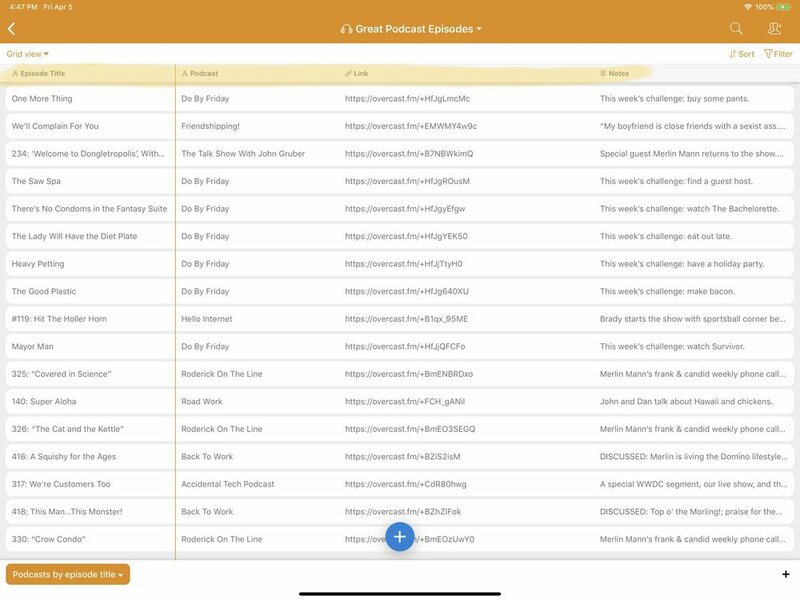 Select the text of the information tab from the podcast title down, grabbing as much of the episode description as you would like to be included in the notes field in Airtable. Press copy to put this text on the clipboard. This shortcut is used as a sharesheet extension, so press the share button and select Shortcuts, then run the shortcut to log the podcast. Your podcast will now be logged in the database ready for you to access it manually or with my second shortcut! This one is pretty straightforward since you already have your database set up from the first shortcut. Download and set up the shortcut using this iCloud link. The shortcut will again ask for your Airtable API key and URL, it is the same as before. And that's it, the shortcut is ready to go! Press on the button for the Listen to a Random Great Podcast. A podcast from the database will open in Overcast. You can press the button from the Shortcuts app, but I typically use it from the Today widget. So there you have it, two shortcuts to help you keep track and listen to your favourite podcasts on demand! If you find these useful or have any questions about getting them to work let me know in the comments! Read on if you're interested in the nitty gritty details of how they work. This shortcut is a good example of several uses of the Get Item from List action as well as using the Get Contents of URL action to add a new entry to Airtable. This shortcut accepts links as an input, which is what gets shared through the sharesheet in Overcast. This input gets assigned as a variable called "link." The shortcut then goes through the text on the clipboard which contains the episode title, the podcast name, the date the episode was released and then the description of the episode. The text on the clipboard gets split up line by line and each line becomes an item in a list, which I assign to the variable "List" so that I can grab that variable every time I need to isolate information that was on the clipboard. Based on the pattern in the information tab in Overcast, I can the retrieve specific information I need to go into each field in the Airtable base. For instance, the first line from the clipboard will be the episode title, so I can use a Get Item from List action to grab the first item and assign it to the variable called "Title." Likewise, the second item from the text on the clipboard is the name of the podcast, so I grab that by using the Item at Index option in the Get Item from List action to get the item at index 2. I've added in a Change Case action to standardize the capitalization of the podcast names before assigning it to the "Podcast" variable. In order to capture the entirety of the podcast description that was copied to the clipboard, I again use the Get Item from List action, but this time with the Items in Range option to start at index 4 in the list (index 3 is the date the podcast was published which I do not log in the Airtable base). I don't restrict the end point (the To Index portion) because the description may have covered many paragraphs, and thus be contained on multiple lines in the list. The podcast description is then added to the variable "Note." The last action of the shortcut uses the Get Contents of URL action. This allows for the creation of a new Airtable base entry via the web. My limited understanding of how this works comes from a lot of googling, Airtable's excellent API documentation and trial and error, so I apologize if this doesn't translate to all cases where you might want to add entries to Airtable. Here I use the POST method as we are sending information to Airtable. The headers basically tell Airtable that you should have access to what you're trying to access and what you are trying to access it with. The request body contains the information that will become your new Airtable entry. 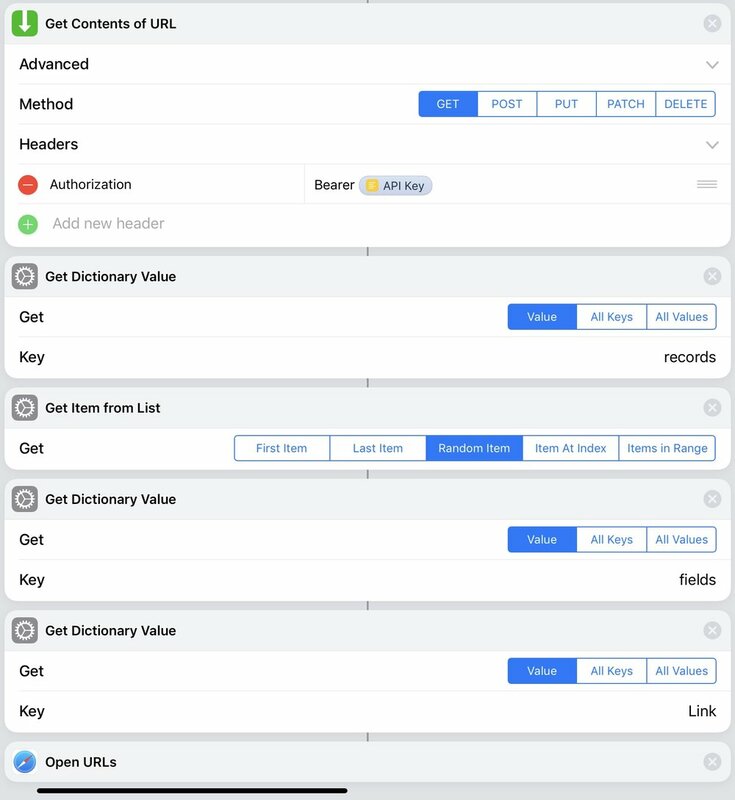 Here, I am creating the post using a dictionary called fields (which is what Airtable recognizes in order to know what to do with the information it contains) with 4 items included. These items are text items which contain a key (the name of the field) and the text that will be added to the field in the form of the variables that were assigned earlier. And with that, a new entry is formed. This shortcut demonstrates a different function of the Get Contents of URL action, and extracting information from dictionaries. The Get Contents of URL action is used with the GET method this time, which pulls out the contents of the Airtable base as a dictionary. Getting this information merely requires your API key authorization. This returns the database as a dictionary which is a collection of values denoted by keys. To access the logged podcasts, I need to get to all records, which I do so through the Get Dictionary Value using "records" as the key. I then use the Get Item from List action to grab a random record. Since we need to pull out the link from that record, we first need to access the fields contained within that record, and then the Link from the from within the fields. This is where the Airtable API documentation really comes in handy to determine what the relevant dictionaries are for a specific piece of information that you want to pull out. A final Open URLs action will open the link in Overcast and your random podcast is ready to be played.